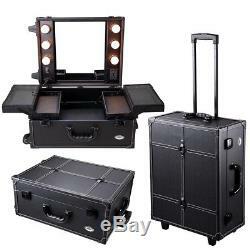 AW Makeup Trolley Rolling Cosmetic Hairdressing Train Case w/ Light & Mirror. 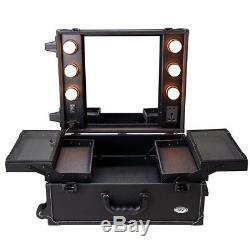 A Portable Makeup Station w/ Light Mirror. Perfect for Studio and Artist Making Up. 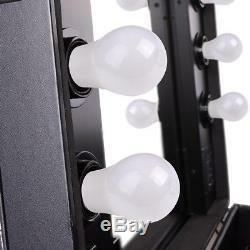 Six 40-Watts Warm Light Bulbs with Dimmer Control. Auxiliary Power Oulets On the Top Cover for Hair Dryer Using. Four Padded Trayed, One Bottom Part, Two Side Compartments and One Rear Compartment for Organization of all your makeup things. Two Trays Covered with Waterproof/Dustproof Thin Layer of Film. 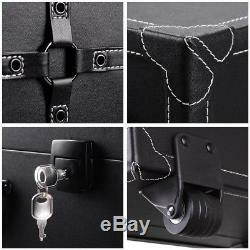 Lock and Key System for Security. Inline Skate Wheels for Easy Mobility and Settling. Heat Resistant Material Keeps the Case Cool and Protects your Cosmetics. 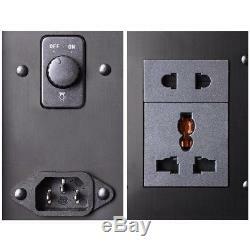 High Quality Medium Density Fiberboard Finish. Compact Dimensions(LxWxH): 40 x 22 x 50cm. Top Cover Mirror(LxW): 29 x 35cm. Center Tray - Bottom Part(LxWxH): 29 x 25x 4cm. Center Tray - Four Padded Trays(LxWxH): 25 x 14 x 3cm. Side Compartments(LxWxH): 38 x 9.5 x 9cm. 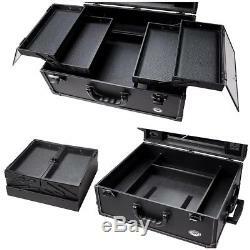 Rear Compartment(LxWxH): 29 x 9 x 9cm. VAT: Our price is VAT included. If you need VAT invoice, please contact one of our customer service member. We can deliver to most European countries. We use a national network of couriers. Most of the deliveries arrive within 1-3 days of dispatch. We do not accept cheques /postal orders. We offer 30 Day Return for all of our items. This does not influence your statutory rights. The item "AW Makeup Trolley Rolling Cosmetic Hairdressing Train Case with Light & Mirror" is in sale since Thursday, August 23, 2018. 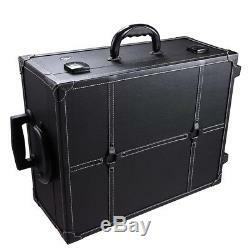 This item is in the category "Health & Beauty\Make-Up\Make-Up Cases & Bags". The seller is "greatchoicehub" and is located in Oldham,Greater Manchester. This item can be shipped to United Kingdom, Austria, Belgium, Bulgaria, Croatia, Cyprus, Czech republic, Denmark, Estonia, Finland, France, Germany, Greece, Hungary, Ireland, Italy, Latvia, Lithuania, Luxembourg, Malta, Netherlands, Poland, Portugal, Romania, Slovakia, Slovenia, Spain, Sweden, Australia, United States, Canada, Brazil, Japan, New Zealand, China, Israel, Hong Kong, Indonesia, Malaysia, Mexico, Singapore, South Korea, Switzerland, Taiwan, Chile.